VMware SD-WAN™ by VeloCloud® simplifies branch WAN networking by automating deployment and improving performance over private, broadband Internet and LTE links for today's increasingly distributed enterprises, as well as service providers. 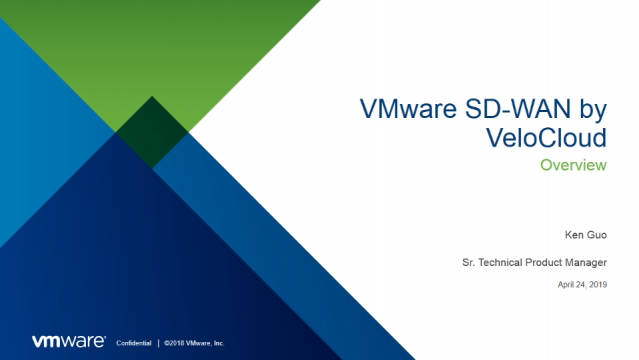 Discover why companies are adopting VMware SD-WAN by VeloCloud as a low-cost solution to accommodate the changing infrastructure requirements as applications, compute and storage are increasingly shifting to public or hybrid clouds. Join this webinar to learn about the benefits of VMware SD-WAN by VeloCloud, the capabilities it provides as a leader in the space, and best practices of a top notch SD-WAN deployment. There are currently no live and recorded webinars or videos in this channel.